H.E. Peter Pellegrini, Deputy Prime Minister (DPM) for Investment in the Slovak Republic, paid a visit to the Special Economic Zone in Duqm (SEZD) on Tuesday (17 October 2017) to have a first-hand view of the projects undertaken and investment opportunities available therein. H.E. Yahya bin Said bin Abdullah Al-Jabri, Chair of the Special Economic Zone Authority in Duqm (SEZAD), briefed Pellegrini and his accompanying delegation on SEZD pointing to the extensive investments of the Government of the Sultanate in SEZD infrastructure, such as Duqm Airport, Duqm Port, and Dry Dock among other infrastructure projects implemented by government and private sector companies. Al-Jabri stressed SEZD various comparative and competitive advantages along with the integrated package of incentives and facilities it offers to investors. For his part, the Slovak DPM for Investment thanked the Sultanate for the warm welcome indicating that his visit provided him with many visions and programs to develop the existing relations between the two countries. A delegation of more than 30 government officials and Slovak businesspeople accompanies Slovak DPM for Investment during his visit to the Sultanate. The visit focuses on boosting the bilateral relations between both countries, particularly in the economic and investment fields. During his visit to SEZD, H.E. 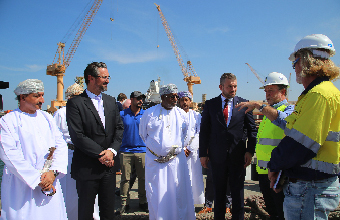 Peter Pellegrini, Slovak DPM for Investment, and his delegation toured a number of projects underway in SEZD, such as Duqm Airport, Dry Dock, and Duqm Port. They also watched presentations on SEZAD, Duqm Port, and Oman Oil Company (OOC), which carries out diversified projects in Duqm.